Good match. It was two big, burly guys slamming into each other, but it was good. Joe is obviously more than just a big guy, and he showed his wrestling brain in this match. Andrea D’Marco asks Asuka if she would rather fight Bayley or Asuka. Asuka will fight both. 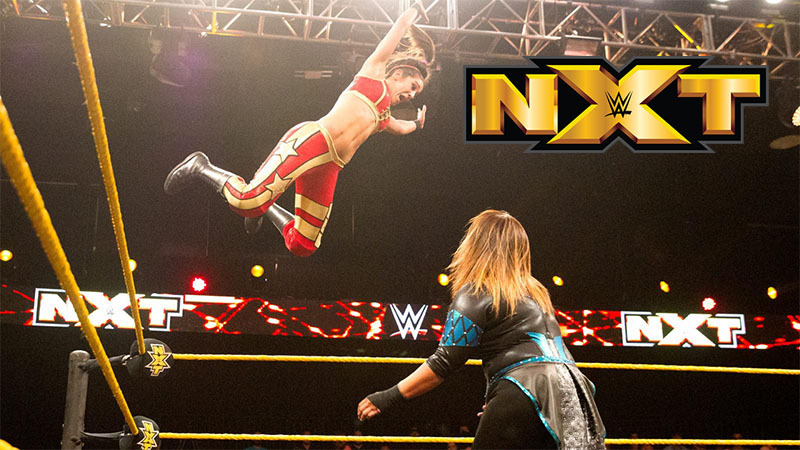 The six NXT draft picks are highighted: Balor, American Alpha, Nia Jax, Alexa Bliss, Mojo Rawley, Carmella. Good match, from before the bell to the end. American Alpha looked great and showed why they got drafted. Towards the beginning, Gable got beat up for a while, then Jordan came in and impressively suplexed both of the Authors. Gable wouldn’t be outdone and suplexed one of his own. Even as the match went on and the pre-match attack started to have a more pronounced effect, Alpha displayed their talent. Cathy Kelley asks The Revival, “what’s next?” They say they broke American Alpha’s spirits, so who can beat them? Ciampa and Gargano show up and say they already beat them. They haven’t held the tag titles yet though. Hideo Itami returns in two weeks. An okay match. It was short and totally one-sided. It was good for Aries though. After the match, No Way Jose attacks Austin Aries. He’s super-pissed. Good match. I didn’t really like the first part, but as it went on Bayley pulled me into it. She did most of the work in making this match enjoyable. I liked this show. It had four very different matches, all (or almost all) good in their own way. I think it’s fitting that American Alpha and Nia Jax went out of NXT on their backs, but this episode made Alpha look great, while it made Nia look very inexperienced. She lost partly because of Bayley’s resilience, but mostly because of her continued over-confidence and poor ring decisions. You’d think she’d have learned by now with all of her losses in big matches. This was a tough one. The main event was good and much longer, but since I didn’t necessarily like the beginning too much, the tag match wins the night. I enjoyed this match even before the bell rang. Even in a losing effort, American Alpha showed how good they are, and The Authors of Pain showed that they’re a force to be reckoned with. It was definitely the best match tonight overall.